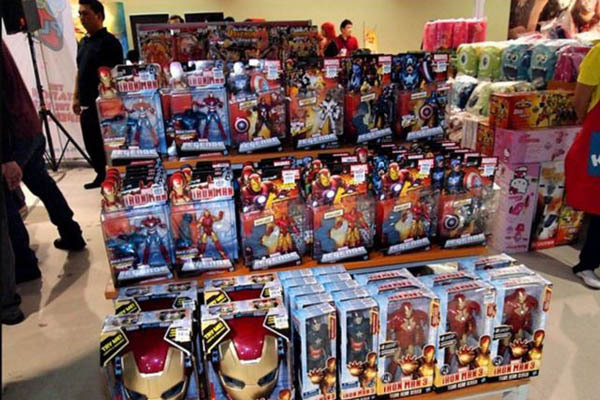 The 15th annual ToyCon is just around the corner and we simply cannot wait for the event. Being its 15th birthday, the brains behind the convention decided to partner up with Pop Life FanXperience to create the ultimate nerdy-geeky event for Filipino pop culture fans. FanXperience is an offshoot event of the Salt Lake Comic Con, the third largest comic convention in the United States. Through ToyCon, Pop Life extends its reach to a global audience with exclusive show merchandise, exhibitions, international cosplay competitions, celebrity appearances, and much more. The event will run from June 10 to12 and will be held at all four halls of the SMX Convention Center in Pasay. 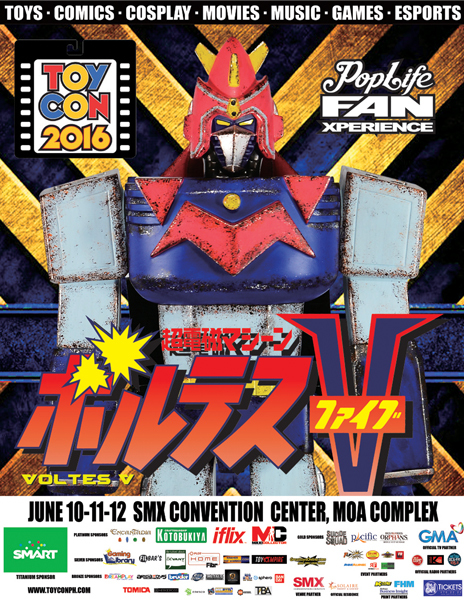 To get a glimpse of what will happen at ToyCon 2016, here's a rundown of the stuff all fanboys will drool over. 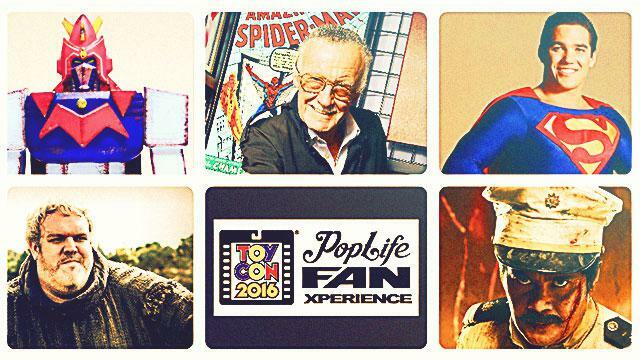 Diehard Marvel fans are in for a treat this weekend as they’ll get to witness firsthand the private collection of Marvel memorabilia of the man himself, Stan Lee. The former president and publisher of Marvel Comics, Lee created some of our most favorite superhero characters such as Spider-Man, The Avengers, X-Men, Hulk, Fantastic Four, and a whole lot more. Unfortunately, Lee won't be able to join this year’s ToyCon but urged everyone to attend through a short clip. 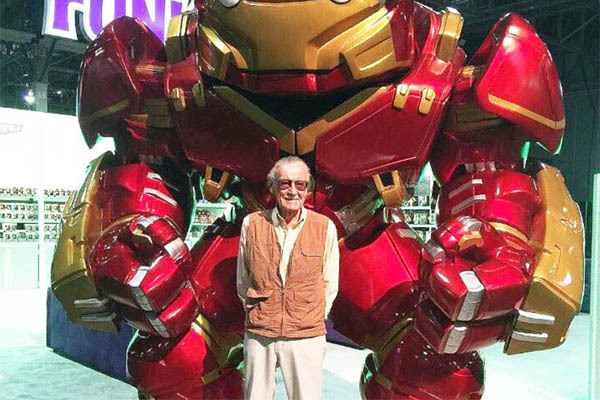 Named after Lee’s “Excelsior!” catchphrase, the collection boasts vintage comic covers, movie props, rare memorabilia, original artwork, and high-end collectibles. 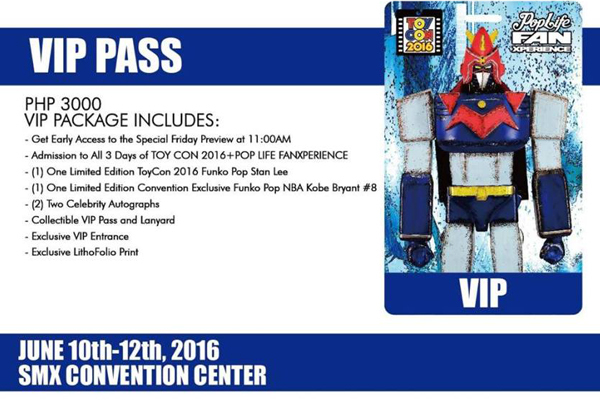 It will also include official merchandise and licensed collectibles for sale exclusively to attendees of the event. 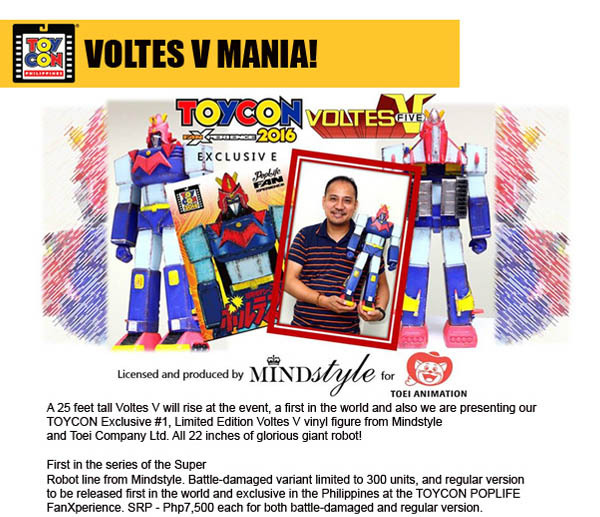 Aside from ToyCon’s 15th anniversary, 2016 is also the 40th anniversary of the beloved animé series Voltes V. To celebrate the occasion, ToyCon is pulling out all stops by not only featuring a Voltes V exhibit, they’ll be also displaying a huge Voltes V model that towers over 25 feet. It'll be the country's biggest toy collectors’ exhibit ever assembled under one roof featuring top toy brands such as Mattel, Bandai, Hasbro, Lego, and many more. 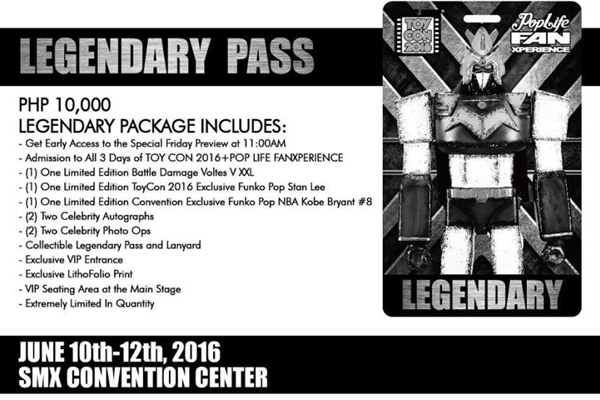 The convention will also display the newest line of Funko Pop toys. 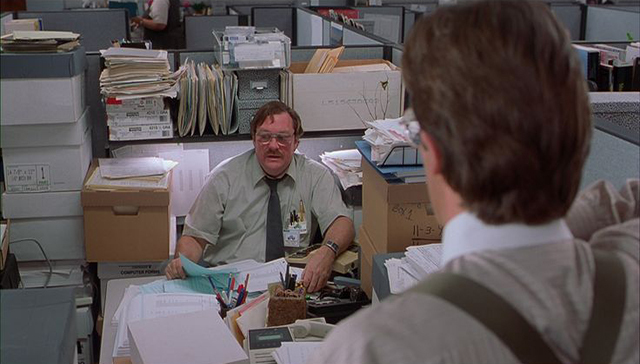 Of course a pop culture convention wouldn’t be complete without people cosplaying as their favorite characters. ToyCon will host two cosplay competitions: (1) The Cosplay FanX Manila Leg, a competition of the FanXperience brand, will be held on the convention’s first day, where competitors may win as much as P25,000 for the individual category and P50,000 for the group category and will also have the chance to represent the country at Cosplay FanX Finals to be held in Thailand; (2) the Toycon Individual Cosplay competition will be held on the last day of the event. 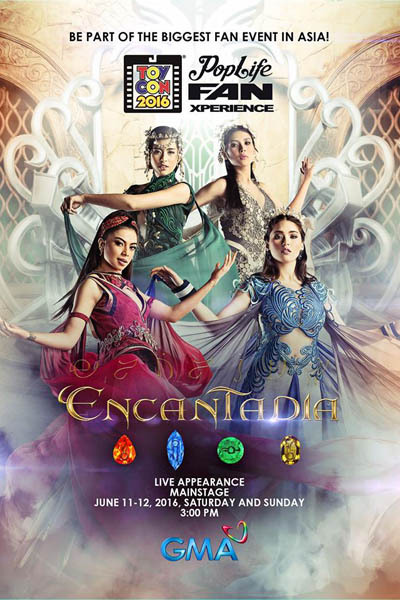 GMA Network will also have presence in this year’s ToyCon, launching the reboot of Encantadia at the event. The show’s cast will be there as well. Game of Thrones fans rejoice! 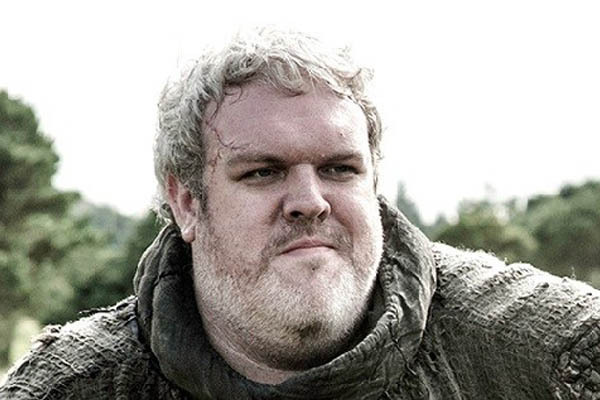 Hodor will be at the event over the weekend. 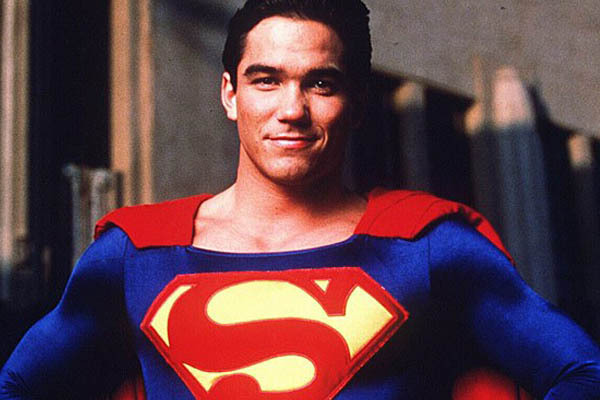 Superman actor Dean Cain will join the celebrity parade of this year’s ToyCon. Cain portrayed the Man of Steel during the '90s in the television series Lois & Clark: The New Adventure of Superman. Currently, Cain is playing the role of Jeremiah Danvers, the adoptive father of Kara Danvers/Supergirl in Supergirl. Fans will also get to meet some of their favorite local and international artists who will feature and maybe even sell some of their sketches. 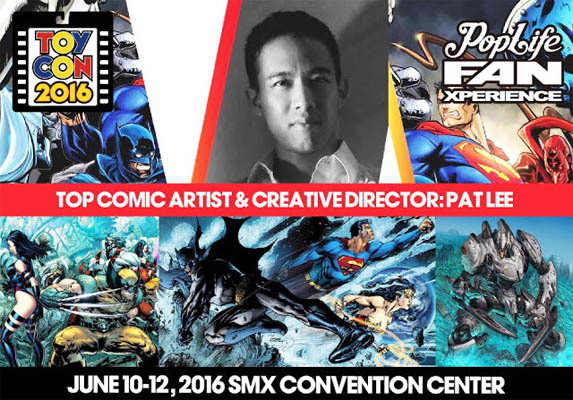 One such artist will be Pat Lee, a veteran comic book artist who has worked for both Marvel and DC comics. Local bands Tanya Markova, Itchyworms, and Parokya ni Edgar will also be present at the event. The event also has special passes that will give its wearer some additional perks, such as additional collectibles, autographs, and VIP seating. Tickets are available at the venue during the event but if you want to get one early, you can buy tickets at the SM tickets website.